View More In Fingertip Towels. And fingertip towels are the answer! Your bathroom doesn't see much love compared to the rest of the rooms in your house, but now there is a solution. but now they can be yours to own or give away as a gift. Everything you need in a fingertip towel! also super absorbent, needing only a quick dab to wipe your face or dry your hands. - So unique and classy they have your own initial on them. - Large enough to help you dry your hands much easier. - The ultimate gift for someone who has everything. - Only comprised of the finest absorbent 100% cotton material. - Designed with a color certain to look gorgeous in any bathroom. then click 'Add to Cart' now! ABSOLUTELY GORGEOUS TOWELS: Your fingertip towels ivory color will automatically make them stand out, with the trim at the edge of the towels adding a touch of class. 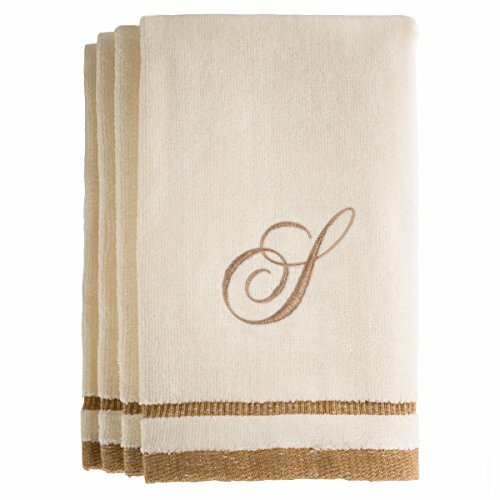 PERFECT UNIQUE GIFT: The hand towels are an ideal personalized gift as they come with most of the letters from A to Z embroidered beautifully in golden brown stitching. SET OF 4: These attractive fingertip towels for bathroom will always be on display, because you'll get 4 of them with every purchase to always have at hand even on laundry day. PREMIUM COTTON DESIGN: Each of the personalized embroidered towels is made of 100% pure cotton which offers unmatched durability and is machine-wash safe for effortless cleaning. EXTRA ABSORBENT: This monogrammed towel set is designed to be extra absorbent for quick drying of your hands and features a soft velour finish for a luxurious feel. Click 'Add to Cart' now! If you have any questions about this product by Creative Scents, contact us by completing and submitting the form below. If you are looking for a specif part number, please include it with your message.